A moment ago, Atari has published an update to their Atari’s Greatest Hits iOS application, to include the support for their upcoming unreleased joystick device for Apple’s iPad, also the update contains bug fixes. 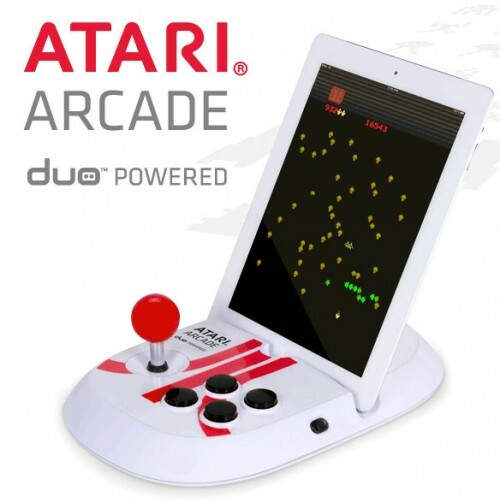 Atari has not announced publicly through any blog, instead they point out their upcoming joystick device “Atari Arcade — Duo Powered” for iPad, in the description of their iOS app. According to the provided image by Atari, the device really looks similar to the well known joystick accessory of iPad named “iCade” from the folks of ThinkGeek. It is also reported that upcoming device to carry simple design than iCade, and also comes with cheaper price at $99. The design of the device suggests to support both landscape and portrait orientations. At the time of reporting, the company has not provided any information about the device, but it seems that device to be used Bluetooth instead of using dock connector.